A young man prayed fervently to the Blessed Virgin Mary for the healing of his brother who was very sick. One day Mary appeared to him and promised him that his brother would be cured. In fact, shortly after it happened, in gratitude he erected a church; Inside was placed against a statue of Our Lady of Grace. In 1690, the coronation of the statue celebrated. Even today in this town, the Sanctuary of the Madonna di Tirano remains. Sabina is located about 40 km north-east of Rome, the area called Sabina extends from the banks of the Tiber to the Sabine mountains, which are part of the chain of the Apennines. The landscape is made up of hills covered with olives, rising to steep mountains, with extensive forests of oak and, everywhere, the small medieval villages, castles and monasteries. It 'a landscape remained largely unchanged over time and little touched by modern development. From the early decades of the tenth century the rural landscape of Sabina changed with great rapidity. The end of the Saracen invasions and Hungarian and the collapse of the Carolingian Empire acted the birth of concentrates and fortified settlements: the castles. A social and economic model most advanced and long-lasting than the peasant villages and the curtes which until that time had characterized the landscape of Sabina as a whole, together with the late medieval Benedictine abbeys, churches and the like Farfa dependent on it. The birth of these fortified settlements concentrated and so strong was tied to the local gentry, largely of Lombard origin, who, taking advantage of the dissolution of the central power and the crisis of Farfa sacked and burned by the Saracens, had reorganized the rural population and it was appropriate rights stately now fragmented at the local level. The area was the scene Sampolese between 9 and 10 June 1505 which witnessed miraculous apparitions of a peasant girl named Joan, daughter of Louis Michael of San Polo. While the young man was busy working the little field of the family, here appearing to her beyond a fence at a little more than three steps, a young monk dressed as fathers served, with the cowl, with the cowl and the hood on his head and "patience" from neck to toe. Served the bore in his hand a large crown characteristic of his order and used to pray to the Virgin Mary and greeted the young girl with the usual form, uttering the phrase "Hail Mary." The girl, though it was was amazed and filled with fear, waved back. The priest assured her blessing and asked what were the revenues of the small field. Joan, put at ease by the gentle manner of his interlocutor replied that hopes to get yourself fruits from the cultivation of the earth, while performing the work with great care, they were very scarce. The replied that served the community Sampolese deserved painful punishment for his bad behavior and only the intervention of the Virgin Mary had prevented merciful God flung his wrath against it by the river in full flood, flooding the fields and consequently destroying the collected. 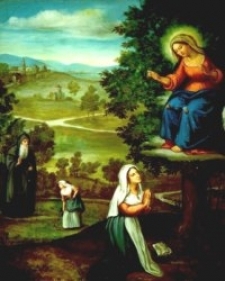 Therefore sampolesi had to fast the following Friday on bread and water in deference to God, who had listened to the prayers of the Virgin and saved the country from a major disaster for his sins and for his sins. The task to convey this message to the local population was given by the young monk to Joan who, however, refused for fear of not being heard. At denial, served blessed the girl and disappeared. The next day, Tuesday, the young peasant was about to go to the fountain to rinse a cloth in the country, when, almost inspired by a premonition, he decided to return to the fields of family where the day before had appeared to the monk. Here, moreover, washed in the waters of the brook cloth and spread it out to dry in the sun and began to wash away the millet near a high and majestic walnut tree grew spontaneously. Joan suddenly he heard himself called by name. Startled, the young looked up and saw the branches of a walnut Lady of ineffable beauty and resplendent. The lady was dressed as nuns of the Third Order of the Servants of Mary, and was wearing a black robe, girded by his side, and a black cloak covering her head, showing just two long locks of golden hair that fell over her shoulders and chest. The woman's face was particularly beautiful, though streaked with tears. 7 - not to neglect by the feasts dedicated to Mary. If sanpolesi had followed orders received would be happy, otherwise woe to them. While he was speaking these words, the Virgin discovered his chest torn by scourges and showed bleeding knees begging the young relate to the suffering she endured to appease the wrath of God, angry with the locals, and to tell what he had seen and heard from the nut. Given that Joan was lingering to fold the cloth dry by now, Madonna urged her to let go and run into town to do his bidding. The peasant girl running in San Polo fled to reveal what had happened in two days. Then came back on the field he found the canvas already folded. From these hierophanies thus was born the devotion to Our Lady of Walnut. Immediately after these events the people of San Polo, turned back, the same year he built on the site of a small shrine, while near the church of the Servites built a small monastery, which was later abolished by Pope Innocent X in 1652 along with 101 other convents minors. Towards the end of the eighteenth century, Cardinal Corsini, carrying a sacred visit to the castle of San Polo, left us a brief description of how effective the church, which was under the patronage of the town sanpolese, and its state of conservation and at the same time gave a brief summary of its history. In the classroom there was an altar dedicated to the Virgin crowned by a table on which is painted the scene of hierophany Marian S.Barnaba below, in part by altering the original narrative by introducing the figure of the patron saint. This picture, however, was not the original, but a late copy, probably made after the suppression of Innocent. The original, from San Polo, ended up on the antiquities market and was bought in the 50s by the then Superintendent of the New York galleries, renovated in 1957, he was recognized as the original of S. Polo. The painting, tempera on panel, dated to the first decades of the '500 and attributed to an unknown painter Lazio, has the dimensions of cm. 178x134 including the original frame and is, even in the current poor state of preservation, so faithful and attentive hierophanies original. The table was assigned to the museum in 1960 in Rieti, while it is currently preserved at the Galleria d'Arte Antica in Barberini Palace awaiting further more extensive restorations. 1-On these events, see T. LEGGIO, Tarano in the Middle Ages, Tarano 1995 passim. 2-On the generality of them in C. BORNTRANGER - P. BRANCHESI, Servants of Mary, in Dictionary of the Institutes of Perfection, VIII, Rome 1988 coll. From 1398 to 1423. 3-The narrative of events is in A. GIANI, Annalium Sacri Ordinis Fratrum servorum B. Mariae Virginis ..., II, Lucae 1721, p. 23-25.